Do you get business from your Facebook Page? Is engagement growing? Are you building your email list through Facebook? 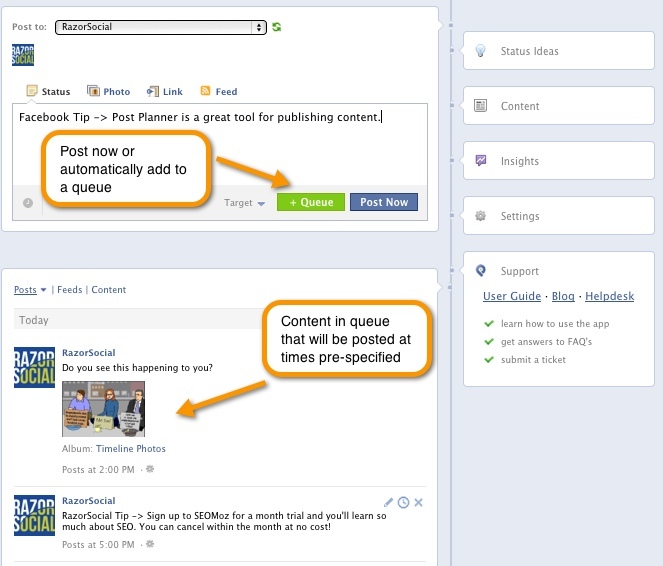 There are many Facebook tools that can help improve the performance of your Facebook page. In this article we outline ways you can use Facebook apps and tools to get more benefit from Facebook for your business. 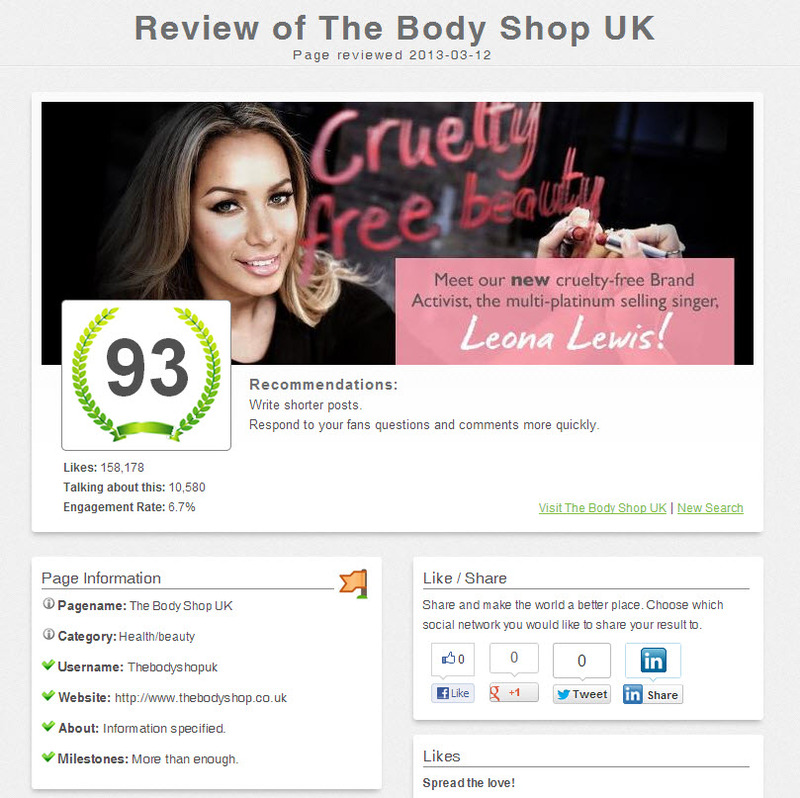 Ideally you want to publish great content, regularly at the right times to the right audience. Unfortunately, copying your Twitter updates to Facebook from Hootsuite is not an ideal strategy even if it reduces the time required. Post Planner is an application that sits within Facebook and helps you plan out and distribute your content. Within PostPlanner, you set up times you want your content to be posted and then when you create the content you can either add it to the queue to be posted at the scheduled times, post it immediately or post it at a completely different time that you specify. Postplanner also helps come up with content ideas if you are short on inspiration that day! 1. Status Ideas – If you’re struggling with ideas for your status updates, you can select a category based on the type of status you want to post and PostPlanner will give you some ideas based on status ideas that generally perform well. 2. Content – If you can’t think of any content, you can select a topic of interest and PostPlanner will display trending topics in this area to help you find content. Also within this section you can add specific sources you want it to always check, such as Facebook pages or blogs that you trust that generally produce good content. 3. Content display – This section shows you the content that is picked up from the trending topics or from the Facebook pages, blogs or Twitter accounts you specified. 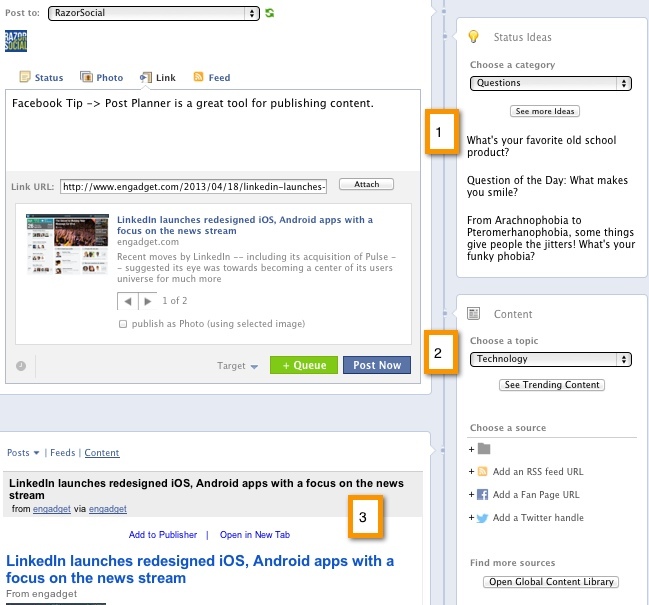 You can then easily add any articles you like to your queue from these sources of content. PostRocket is on my watch list at the moment as I believe this tool has great potential. PostRocket analyzes all your posts on Facebook and lets you automatically schedule your content at the optimal time. This means you don’t have to worry about the timing, you just figure out the posts! There’s also a really neat feature when you are posting pictures. It provides an editor which allows you to change how the image looks (similar to Instagram) and also lets you write on the pictures. Writing on the pictures can be a very powerful way of getting your images noticed. Version 2.0 of Postrocket is due out very soon so we’ll be watching this tool with interest. Within Facebook you can build up your page like a website with some additional menu options which can be used to run applications. 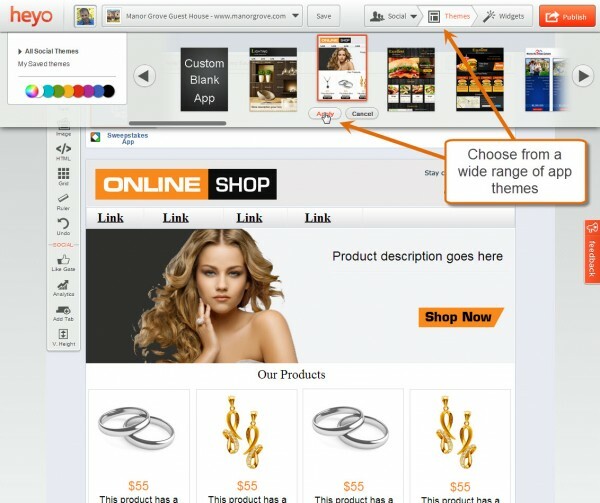 Anything you can do on a website you can do within these applications. 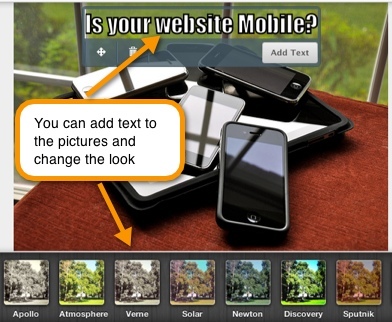 You could even embed your whole website within these apps! The only issue with these applications is that you need to drive your fans to them to benefit. 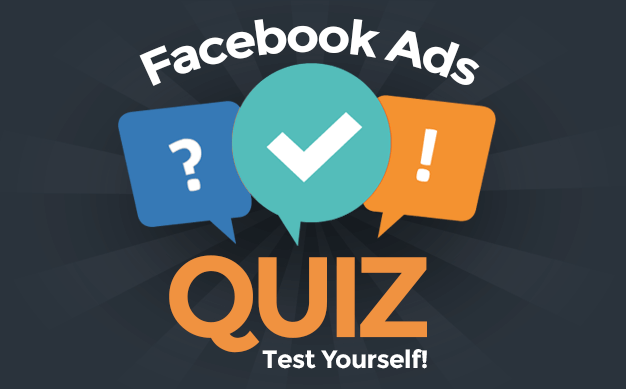 Facebook Advertising – When you advertise on Facebook instead of bringing people to the timeline, you could direct them to a custom app which gives them strong encouragement and possibly an incentive to become a fan. Website – When you a link to your Facebook page on your website, why not direct them to a landing page on Facebook which has a custom app? This app could be used to convince people to sign up. Linking to this app – Within your status updates on Facebook or other social media platforms you can provide a link to direct people directly to the app. Heyo provides you with a suite of templates you can use to create a custom application for your business, and this application can also run on a mobile device or on your website. Facebook competitions can be a great way of increasing fans, promoting engagement and also building your email list. When you get your fans to subscribe to your email list, you can then promote your products and services through Facebook and also over email! 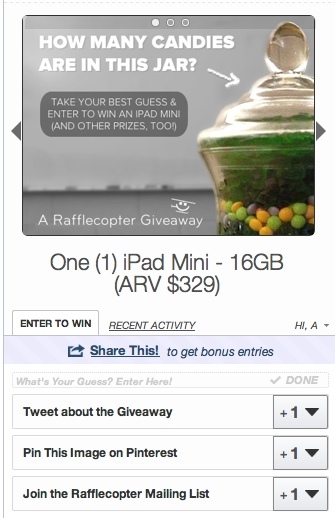 RaffleCopter provides some great functionality that uses incentives to promote sharing and email signups. In the example below, the participants can earn a second chance to enter the competition by performing some actions such as sharing a tweet or subscribing via email. Consider what you can do in your competitions to get more than just a fan? 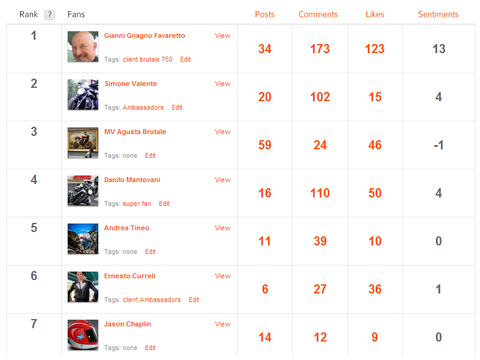 Agorapulse provides not only a suite of great applications but also a database for building up a profile of your fans. When you run a competition, you consider what type of information you would like to get from fans to learn more about them and build this into the competition. You can then target fans for sales using this profile information. Agorapulse provides a range of applications such as photo competition, sweepstakes, coupon app, fan vote competition, and much more. Facebook Insights provides some great detail, but sometimes you want to just look at an overview of what’s working and what’s not. LikeAlyzer is a simple tool for analyzing the performance of your Facebook page. You enter in your Facebook page name and it will give you a score out of 100 with some recommendations on how to improve it. If you implement the recommendations your fans and engagement will go up! 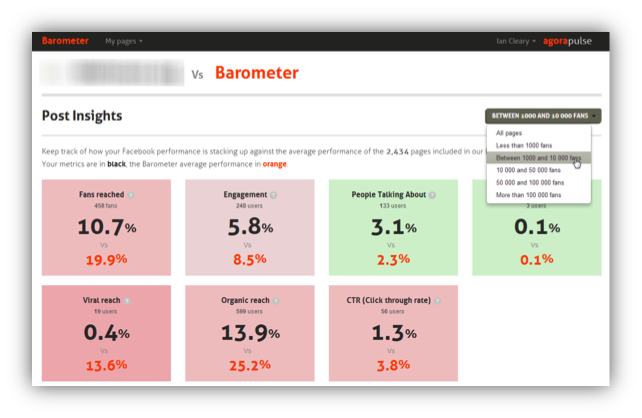 Agorapulse provides a free tool which allows you to compare your performance against other companies that analyzed their page using the Agorapulse barometer. It compares your page against other pages of a similar size, and determines whether you are above or below average in a number of areas, such as engagement, reach and much more. In this article, we hope that we have given you some actionable ideas and some inspiration to review your page again to see how you can make improvements and generate a better return for the time spent on it. Will you try out any of the above? What other ideas would you like to share? Ian Cleary is a social media tools and social media technology specialist. He is a recognized social media speaker and his blog was one of the top 10 blogs in the annual social media examiner annual blog awards. To learn more about social media tools and technology follow Ian’s blog Razorsocial.